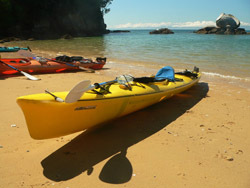 Sea Kayaking brings you close to the wildlife below and above! Flying fish, turtles and all the sea reveals below while frigate birds, pelicans and all the sky has to offer above. Kayaking the open sea is an exciting way to explore Costa Rica's marine and coastal life. Novice to advanced kayakers can enjoy the various tours available from numerous outfitters throughout Costa Rica. There's 635 miles of pacific coastline to enjoy by kayak along with 132 miles of gulf/Caribbean coastline and hundreds of rivers and canals. Paddle past caimans and crocs on the rivers, see orcas and other whales in the ocean and watch scarlet macaws fly over head. There are many full day, half-day and multi-day excursions available.